Ann Hawkins of the Inspired Group gave an excellent seminar on Blogging, with items for everyone; from the novice to the active blogger, at the Huntingdonshire Business Network monthly seminar last Friday. I left with my mind buzzing with ideas on how to change my blog. Blogger has included some additional user friendly design features to the blogger dashboard since I first set up my blog in 2007. I therefore had to update my blog to a newer template to be able to use these. Fairly straightforward, though I did have to reintroduce my Google Analytics tracking code. The real benefit is that the Blogger dashboard then has a tab called "Design", which makes changing the layout and adding elements very simple by adding "Gadgets" that you desire! 2. Adding Labels/Categories to organise my articles. My overall interests are wide and varied, under the umbrella of helping businesses communicate in Print, Pictures and Person. I can equally be active facilitating transnational company meetings, doing a local photoshoot or publishing a book for a local author. 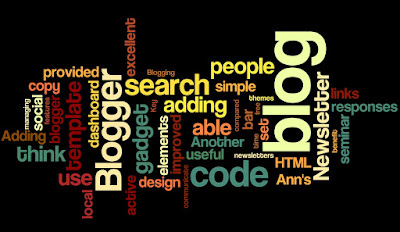 By adding the "Labels" gadget to my blog design, I was able to categorise my blogs into subject areas and present them in a Tag Cloud form in the right column. Another useful addition was a search bar so people could search by keyword. Oh Bliss, it was so simple to set up compared to what I would have had to do a couple of years ago! Since many people are now on a variety of social media, it only seemed appropriate to add links to my locations in Twitter, Facebook and LinkedIn to the blog template. This was a little more complicated as I had to obtain HTML code snippets and logo images from each social network. Fortunately, I was able to copy this from my Newsletter template. Blogger provided a gadget that permitted the introduction of your own HTML or Java code blocks. Well, I certainly think my blog has been dramatically improved after following some of Ann's tips in her excellent Seminar! But what do YOU think? What would you have done differently? I hope your updates attract lots of new readers!